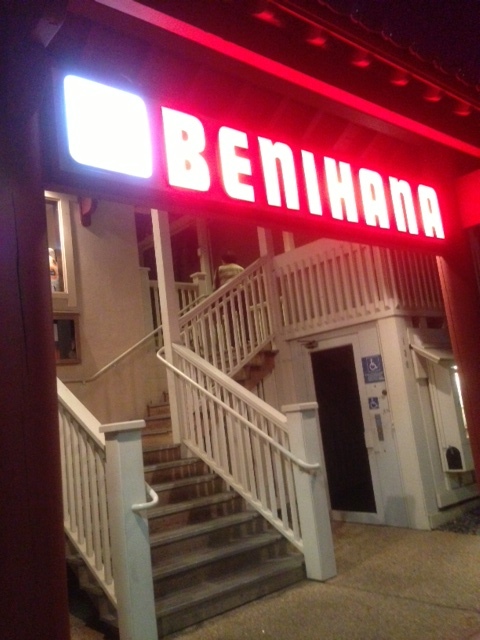 I received a $30 gift certificate for Benihana for my birthday through joining The Chef’s Table (which is free) and had a lovely dinner at the Benihana in Monterey, California. We were seated with another group, which is usually the case at Benihana if it is busy, so it was a little cramped but still enjoyable. I selected the Samurai Treat entree meal. We started off with a clear mushroom soup, which had a nice light flavor to it, as well as some salad. Then, since we knew one of the waitresses, she brought over two different plates of sushi: Shrimp tempura with avocado and California roll. The shrimp tempura roll were little bites of yummyness- Slightly crunchy, drizzled with that wonderful brown sauce and great flavor. 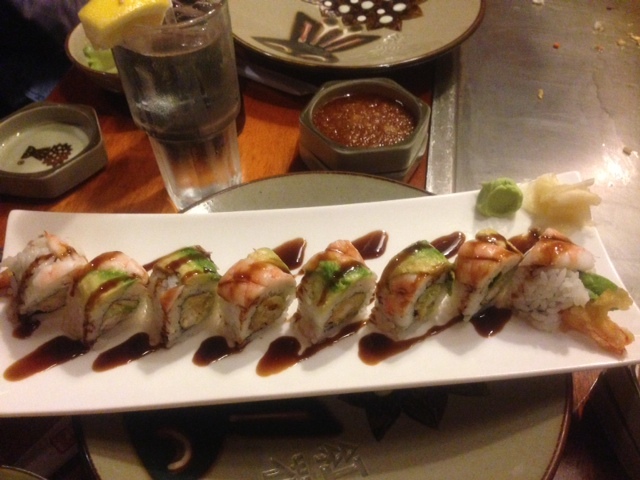 The California roll was also good, but the shrimp tempura was better. After that, our chef, Joshua came out. He was both skilled and personable. 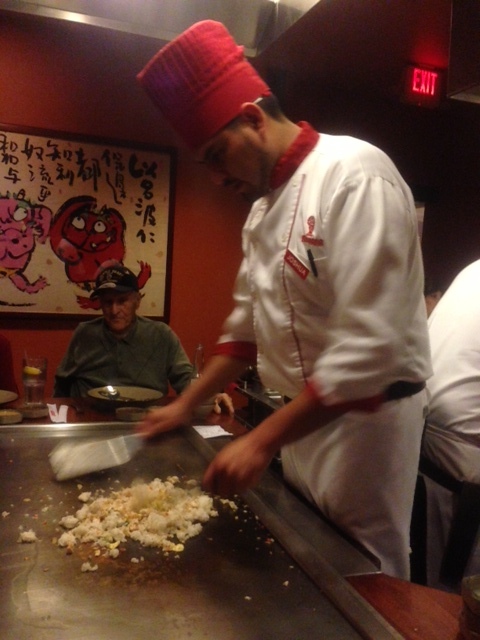 He gave quite a show, juggling the utensils and below he is creating the chicken fried rice right in front of our eyes! He shaped the fried rice into a heart and started making it look like it was moving, while flicking the lights on and off. That was pretty awesome. The fried rice was very tasty, with slightly browned chicken, along with onion and other vegetables. There was great flavor and everything combined together wonderfully. 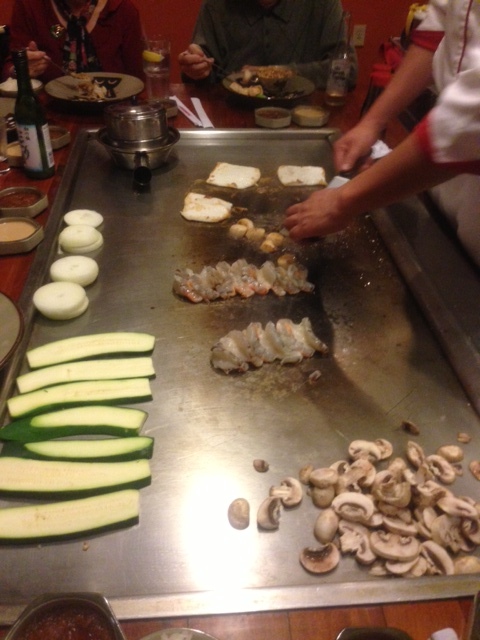 Then, the chef started on the meal, cooking the zucchini, onion, mushroom and shrimp. He cooked everything with butter and used a couple of different sauces. He served the shrimp first – There were two different types. One was colossal shrimp grilled with lemon and butter and the other was a smaller size shrimp that tasted just as good. The shrimp was juicy, succulent and very flavorful. As for the vegetables, he stacked up the onions to look like a volcano and poured water over it so that it looked like it was erupting. The vegetables tasted fresh with a soft texture. The filet mignon, grilled to perfection, completed the meal. It was melt in your mouth tender, rich with flavor and full of deliciousness! I also really liked the teriyaki beef julienne. The teriyaki sauce was divine- The right combination of sweet and salty, and the beef was also incredibly tender. And I loved the sauce so much that I would’ve loved it to coat the filet mignon! 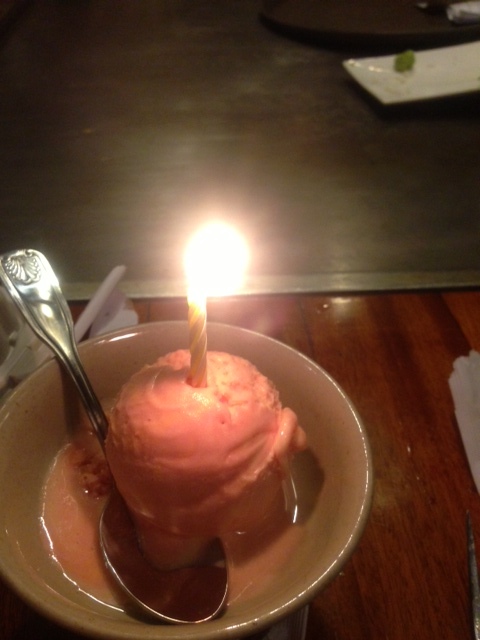 Our meals came with ice cream, so I chose rainbow sherbet which was a beautiful bright pink and came with a cute little candle. The sherbet was okay, but a little too sweet. I also got to try the green tea ice cream, which was lovely and light. 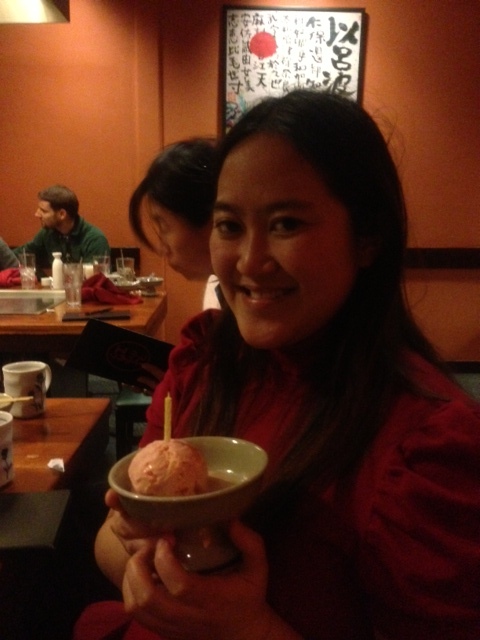 The staff at Benihana did their traditional birthday routine: Singing Happy Birthday in Japanese while drumming. then leading the Happy Birthday song in English. 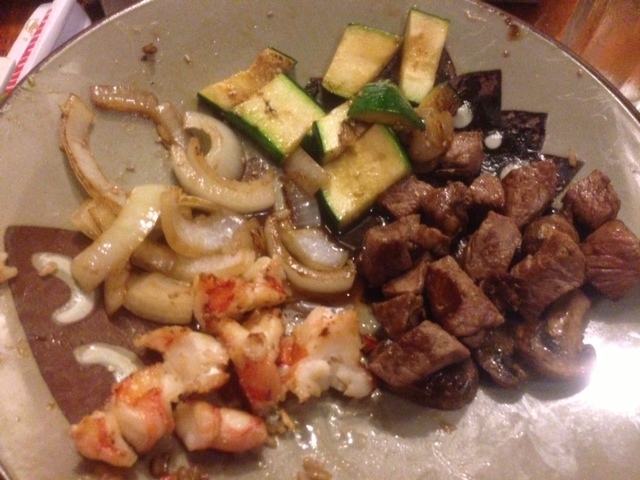 This was a wonderful meal…. Quite the visionary and culinary experience!